The Minnesota Timberwolves open the regular season Wednesday, Oct. 17 in San Antonio, before returning to Minneapolis to host the Cleveland Cavaliers for their home opener Friday, Oct. 19. The league revealed its full regular-season schedule Friday afternoon. It’s a matchup with some major significance for Minnesota fans: Cavaliers star Kevin Love spent six seasons with the Wolves from 2008-14, and signed a four-year, $120 million extension with Cleveland earlier this summer. Wolves fans get their first look at LeBron James and the new-look Los Angeles Lakers on Monday, Oct. 29 at Target Center. They’ll meet again the following week, part of a five-game road trip, the Wolves’ longest of the season, that features the Golden State Warriors, Portland Trail Blazers, Los Angeles Clippers, Lakers and Sacramento Kings. The Lakers also visit Target Center Sunday, Jan. 6. Wolves fans will also get an early look at former Minnesota star Ricky Rubio when the Utah Jazz visit on Wednesday, Oct. 31. Minnesota hosts its longest homestand of the season from Nov. 12-21, a stretch that features the Brooklyn Nets, New Orleans Pelicans, Trail Blazers, Memphis Grizzlies and Denver Nuggets. 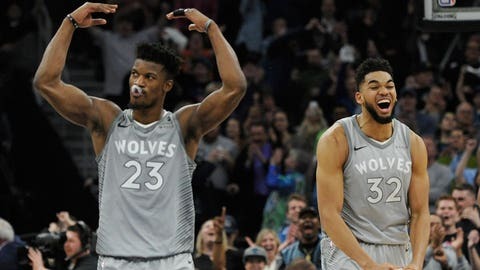 The Nuggets, who missed the playoffs last season, last visited Target Center for the final game of the regular season earlier this year, when the Wolves secured a playoff spot with a 112-106 overtime win. Former Wolves Zach LaVine and Kris Dunn return to Minnesota as members of the Chicago Bulls on Saturday, Nov. 24 for a matchup between head coach Tom Thibodeau and his former team.